This set of The Daily Reading Morning Work is now available in a GOOGLE CLASSROOM VERSION included in this download! PLEASE NOTE This set is included in a bundle that provides daily reading for the entire year! CLICK HERE TO SEE THE BUNDLE. • Use them as bell work at the beginning of the school day. • Use them as a warm-up to reading during your reading workshop. 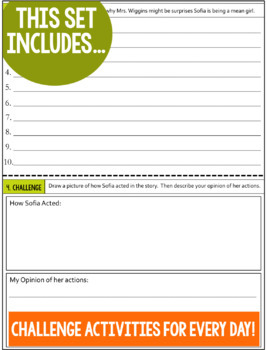 • Use them as ‘exit slips’ at the end of the school day or reading workshop. • Place them in a literacy center for comprehension. • Use them in guided reading as a quick warm-up to the lesson. • Send them home for extra practice and support! • Have students work in partners or small groups to complete the daily work. • Use them for tutoring. • And any other way you see this working for your unique schedule and student needs! 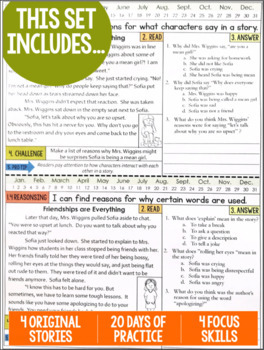 • This resource is designed for your students to receive just a few minutes a day of extra practice with key comprehension skills they need to be successful, independent readers and thinkers. 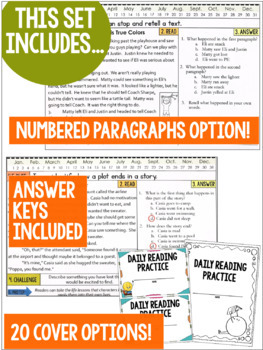 • These quick daily practice pages are perfect for ensuring that what you are teaching and modeling in class about reading is sticking with your kids! 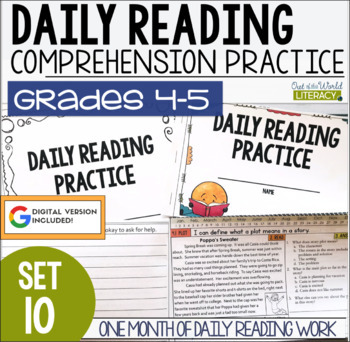 • Through these daily practice pages, you can ensure students are spending time thinking about their reading and practicing these very important skills! • An ‘I Can’ statement with a helpful reading comprehension reminder. • An original story for each week. Stories are broken into 5 sections, so that students read a different part of the story each day of the week. • A custom illustration to match each day. • Two multiple choice questions about the passage that are related to the mini lesson focus statement. • One open-ended question about the comprehension skill. *** There are 20 days of practice for grades 4-5 included in this set, enough for an entire month! Download the free preview to see more!